The Persian Gulf state of Bahrain has been governed by the Al Khalifa family since the late 18th century. 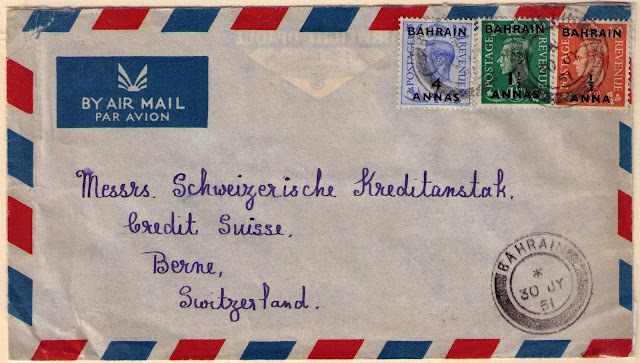 In 1820, Great Britain and Bahrain entered into the first of many treaties in which Bahrain became a British Protectorate until it became an independent state in 1971. 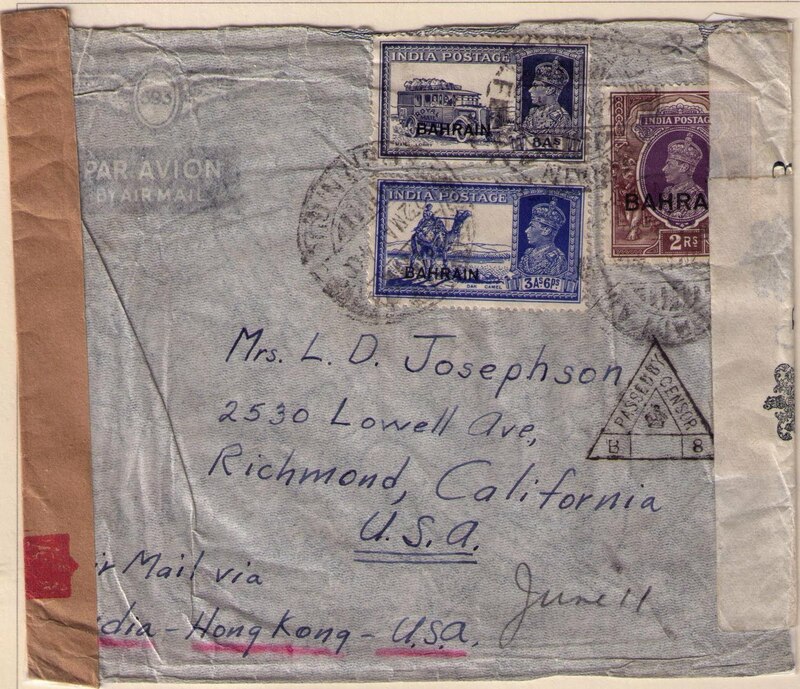 A postal service was operated in Bahrain by the Indian postal administration in Bombay from 1884. From 1933, Bahrain started using Indian Stamps overprinted "Bahrain". 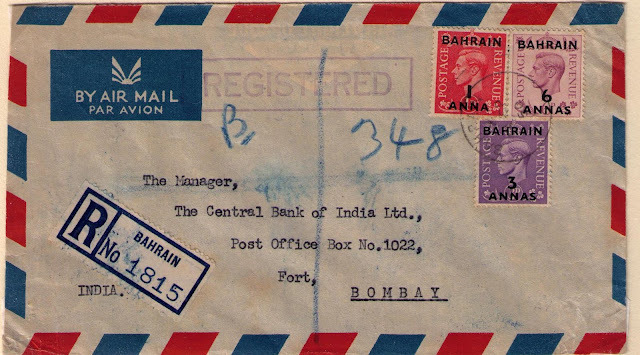 With the independence of India in 1947, the Bahrain Post Office was managed by the Pakistani government in Karachi until March 31, 1948. 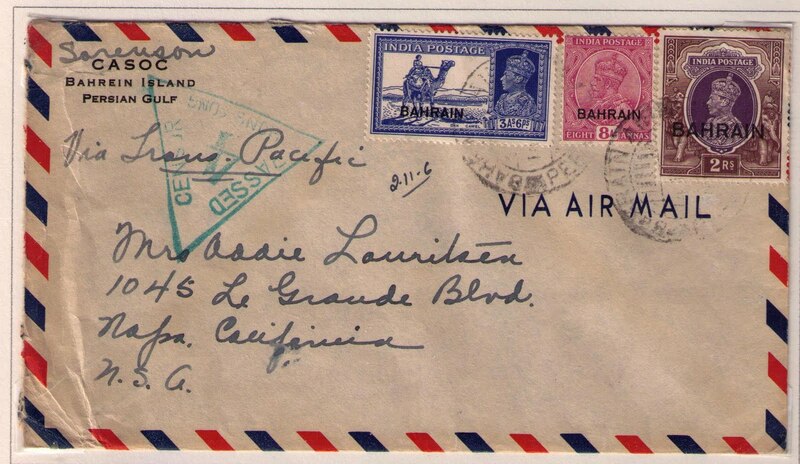 On April 1, 1948, the British G.P.O took over postal agencies from Pakistan. 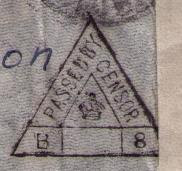 For this reason the previously overprinted Indian stamps were replaced by overprinted GB stamps in 1948. 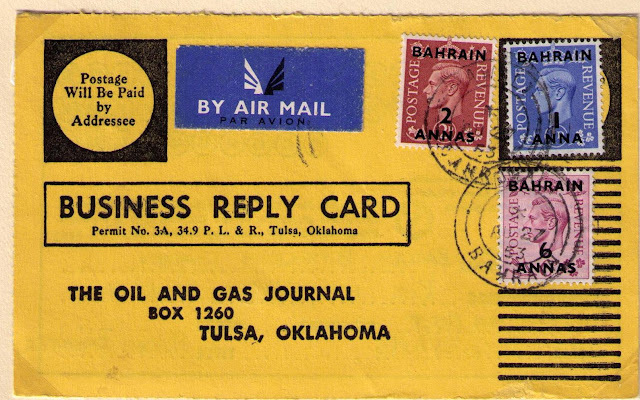 On 31 December 1965 the GB postal administration was closed and control handed over to the Bahrain postal department on 1 January 1966. 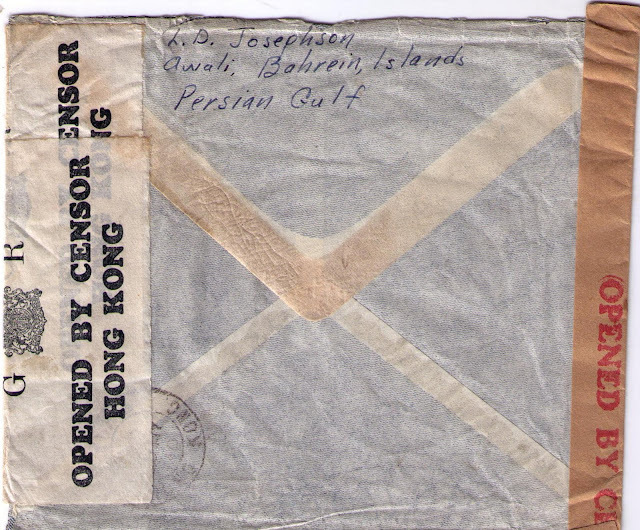 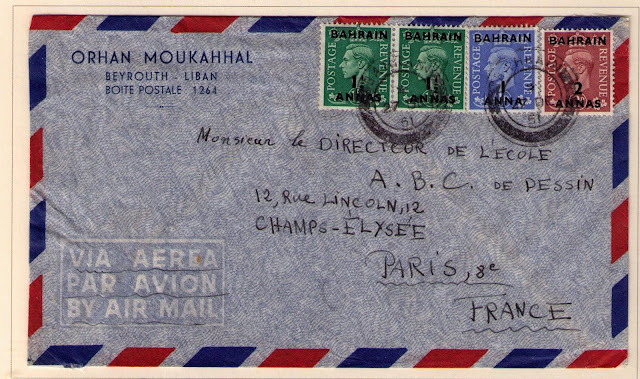 This article shows covers posted from Bahrain during the George VI period. 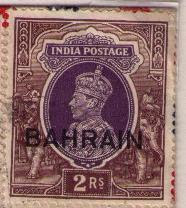 Stamps of India overprinted "Bahrain" were issued from 1933. 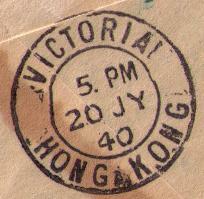 The route went via Karachi and Bangkok, then by land-plane service to Hong Kong with stops at Hanoi and Wai Chao Island (in the Gulf on Tonking) as part of the Horseshoe route. From Hong Kong the route was PanAm Airways Trans-Pacific air service via Manila, Wake Island, Midway, Honolulu to San Francisco. 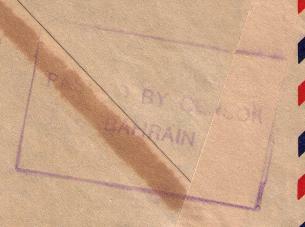 British stamps overprinted "Bahrain" were first issued in 1948. 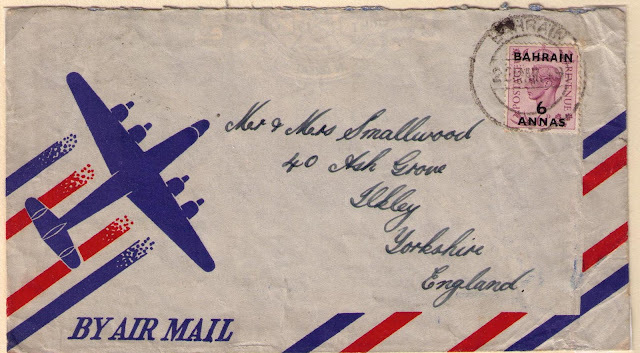 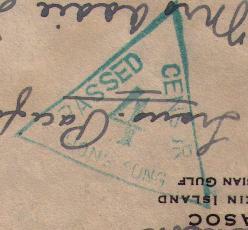 Air Mail Post Card to the U.S.A.
9 annas paying the air mail post card rate to the U.S.A.